This plant compares to alfalfa in nutritional value. Here are some ways to use that nutrition to manage this plant in your pastures. 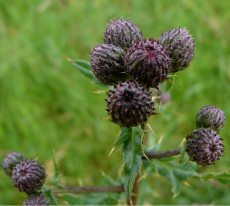 Canada thistle (Cirsium arvense) is most often compared to alfalfa for its nutritional quality. A breakdown of its crude protein was provided by Oregon State University of 21% in the Spring, 13% in Summer and 12% in the Fall. Such high protein values make it quite palatable all season long. Animals should especially like it in the summer when grasses are beginning to dry and are losing their protein values. Kathy Voth has trained over 1000 cattle and a small herd of bison to eat this tasty weed, so we give it a big thumbs up as a forage. While the spines are not a problem for grazers, the potential for nitrate accumulation in the plant is. The problem with nitrate accumulators is not the nitrate itself, but the chemical process that takes place in the rumen. Nitrate is reduced in the rumen in a series of steps from nitrate to nitrite to ammonia and finally to microbial proteins. It is the nitrite in this step that causes poisoning if it accumulates in large amounts. When the animal has carbohydrates in its rumen, nitrates are more rapidly converted to ammonia and proteins, preventing the potential for nitrite accumulation. (Cite Knight) Researchers have also found that rumen microbes can adapt to nitrate processing over a period of 5 to 7 days of slow introduction to nitrate accumulating plants. (Knight et al; Waller) So the best thing to do when working with ruminants on nitrate-accumulating plants like goldenrods and Canada thistle, is to allow the rumen microbes time to adjust to nitrates in plants by feeding just a little at a time and providing plenty of variety in pasture. Never put animals on a solid stand of this plant. They must have other forage to mix with it to prevent poisoning. Give rumen microbes time to adjust to this plant. Introduce the food in small amounts over a period of 5 to 7 days. Don’t put hungry animals into a field that is largely made up of this weed. Make sure that they have a full stomach when moving to a new pasture with large stands of Canada thistle. This will ensure that they have the necessary carbohydrates in their rumen to aid the rumen microbes in breaking down nitrate. Initially animals begin by eating the tops of the thistle. They also seem to prefer the older, coarser stemmed thistle plants over the newly emerged sprouts, though they will eat all ages. Over the course of a summer, animals trained to eat Canada thistle learn to graze it to the same level as they graze grasses, and generalize to other thistle species such as musk and bull thistle. 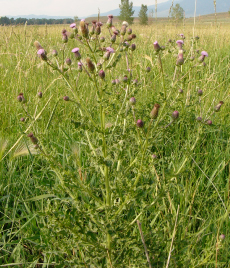 Cows trained to eat Canada thistle will generalize to other types of thistles in pasture and add them to their diets. Lewistown, MT heifer eats Canada thistle in pasture. People in North America have been challenged by Canada thistle ever since it hitched a ride with other seeds on their way to the French and British colonies. Its spread was so successful that in 1795, Vermont passed the first legislation requiring landowners to control Canada thistle, and New York followed suit in 1831. It is now known as “Lettuce from Hell” thistle. Canada thistle was such a problem that it caused the Canadians to write first weed eradication law in North America: the Canada Thistle Eradication Act of 1865. One of the reasons it has been so successful all over the world is that it can reproduce from both seeds and roots. Flowers on Canada thistle each produce from 40-80 seeds, and each seed can float in the wind attached to a bit of down, or a pappus. Maturing rapidly, the seeds can germinate 8-10 days after pollination, but the seeds stay viable for up to 22 years. Once the plant is established, it propagates through its roots. The roots are extensive and may penetrate to depths of 10 feet or more, growing 12-15 feet laterally each year. Root buds occur at random intervals along the length of the roots, and can produce new shoots if conditions are favorable. A segment of just 0.6 inch in length can develop a shoot and become an established plant. Making it even more of a super-invader, these small pieces of roots can survive at least 100 days without receiving nutritional supplementation from photosynthesis. 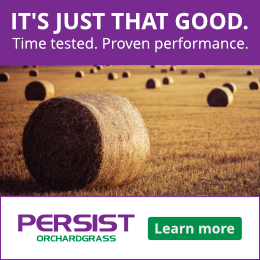 If you’re determined to rid your pastures of Canada thistle, all that information may give you pause, but you do have options. You can manage your educated livestock to reduce it by grazing it early and often. Researchers suggest beginning grazing when rosettes first appear. Unfortunately, research also indicates that topping or grazing the plant stimulates new growth, so the plant must be grazed repeatedly to weaken nutrient transfer to roots and reduce its ability to regrow. Shoot populations can be reduced to very low levels by regular, short-term, rotational grazing. 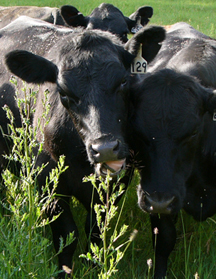 Animals should be moved from a pasture when necessary to protect preferred species, and returning to regraze new Canada thistle sprouts if grazing will not harm preferred species. Established grasses and alfalfa can compete with Canada thistle, if they are provided with good soil fertility and adequate moisture. 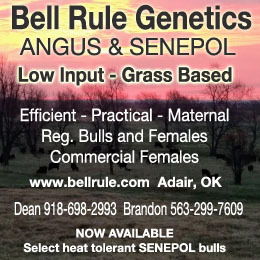 Alfalfa is only effective at competing once it has been established. 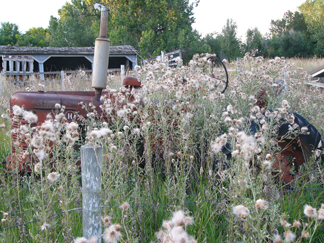 Mowing is recommended for bull thistle, but it spurs Canada thistle to develop new shoots from its root system. If you are going to mow regularly, though, this may help draw down the plant’s root resources. Biological controls are also a good tool, with at least 84 species of insects, as well as fungus species and weevils that act as biological controls. If you find Canada thistle is in your midst, be comforted in knowing that it has some redeeming qualities. Its young leaves are edible and considered remarkably tasty. One recommendation is to roll up individual leaves to smash their spines and eat them like that, or place them whole on sandwiches. The stalks, while they are still flexible, can be peeled and eaten raw. Pam Sherman of Boulder, Colorado picks and rinses foot-tall thistle and cooks the stems and leaves in stock to soften the spines. Then she purees them with milk and adds onion garlic and salt to make a tasty cream soup. Whatever you decide to do with your Canada thistle, we feel sure it will be around for many livestock and human meals to come. 6/30/13 I just mowed 20 acres that beef and horses have been on. There were a few Canadian thistles other years, but today there were solid patches 4′ high, about 20% in bloom. It was seeded with brome and alfalfa 12 yrs. ago and in CRP for 10 yrs. before that. Now it is mostly what we call sod bound, except there were patches of creeping charlie. A brick yard adjoined this farm, which has the same clay. I’ve spread a lot of organic matter on this field, in that town people have been dumping compostables here for 21 years, the cattle are fed on the huge pile all winter and I push it with a large dozer, so only part of it heats. We’ve had an unusually cold wet May and June. Do you think there will be a problem feeding round bales, some of which will be almost totally thistle? I’m organic and would rather not dig it. Is there anything I could no til into it, that could compete with the thistle. I’ve spread the same organic mater on another field, that had no bare/creeping charlie patches and heavy sod and no thistles have appeared there. Thanks for any suggestions. One of the comments on our facebook page was from a fellow whose cattle weren’t eating their thistle in their night pasture. He and I will talk shortly so that I can help him solve this problem, and I wanted to share some information here for those I may not get to talk to individually. One of the issues with a plant that is as high in protein as Canada thistle (or alfalfa) is that an animal can only eat so much of it before it needs to eat something else. For example, I’ve watched cattle in pasture eat lots of thistle, and then head for yellow, dried out cheat grass to balance the high protein with some roughage. My rule of thumb is that if an animal isn’t eating something that I know is nutritious, it’s my job to figure out what I need to change in my management. Does the animal need some education? Is it the timing of when something is being grazed? Have I taught them to expect that I’ll move the herd soon so that they don’t have to clean their plates? I’ll be sharing more about this in coming articles. Stay tuned!